Australia is a truly iconic destination - its buildings, its wildlife and even its shape are known around the world. It's a land of kangaroos and koalas, aborigines and the dusty red outback, surfer dudes and spectacularly bad, but equally addictive, television soap operas. Of course, away from these superficial images of Oz lies a country as complex as it is vast. It's a country struggling to reconcile its traditional beliefs underpinned by Christianity with the more liberal demands of a modern, cosmopolitan populace in its big cities. Indeed, the debate about whether to legalise gay marriage dominated the headlines during our stay (see a particularly crass and tasteless advert for scrap metal which parodies the famous gay film 'Brokeback Mountain' here). Australia's glitzy cities feel seemingly at odds with the country's native Aborigine population with racial tensions finding their expression through quiet, dignified protest: "Black houses on black land" declared one giant banner flapping along the walls of the train station as we were entering Sydney Central. Similarly, watching Australia's morning TV programme Sunrise, which has a large window backdrop out onto a Sydney street and which presenters sit in front of, an Aborigine man holds up a placard declaring "I won't be bullied by racist neighbours or government". The Sunrise cameras do their best to avoid the placard taking centre stage but fail dismally (see here). Add to this Australia's British imperial hangover (New Zealand is currently in the process of choosing a new flag which does away with the Union Jack), the cultural and economic influence of oriental neighbours like China, Japan and Korea, and it's safe to say that you've got a very interesting country ahead of you when you step off the plane. Australia's not all cute koalas and opera houses. My journey to Australia marked my 66th country and, touching down on the continent of Oceania, my fifth continent too. Going Down Under is the furthest south I have ever travelled and the first time I've crossed the Equator; Australia therefore broke new travel ground for me - metaphorically but also literally. Taking three connecting flights to get there, it's also the furthest I have ever travelled to get to a single destination. This was a mini road trip along part of the famous Princes Highway and a small part of the picturesque Grand Pacific Drive from Sydney down the coast to Melbourne and stopping overnight along the way at lesser-known places like Narooma and Mallacoota to sample Aussie life outside of the great cities. A visit to New South Wales' Blue Mountains at both Blackheath and Katoomba using the Aussie train network ensured we included a token dip into Australia's bushland too. We were keen not to repeat the mistakes of a similar trip along Canada's eastern coastline by train in 2011 which was exclusively city-based and therefore lacked an authentic, local edge away from the tourist honey traps. Once you've seen one city, you've seen them all, right? Our Aussie adventure was therefore deliberately varied: cosmopolitan cities, coastlines, countryside, bushland and frontier towns with Wild West-style architecture - all by rail and by hire car. 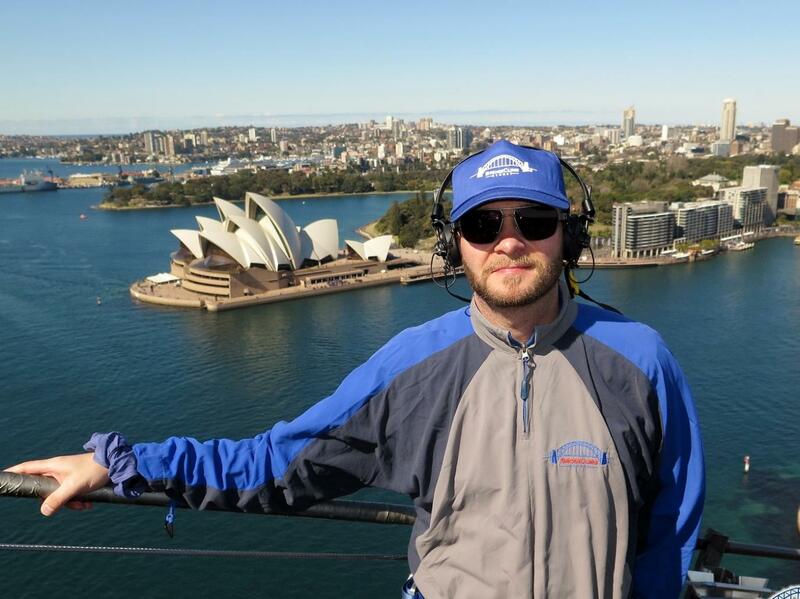 Update: In March 2016 I emigrated to Sydney, Australia. Check out my Australia Blog which charts the highs and lows of my move Down Under. City of world renown and our base for the first four days of our trip was Sydney - in the popular mind the de-facto 'capital' of Australia. The actual capital is Canberra - Australia's political and administrative centre and, being thus, no one seems to want to go there - least of all tourists. It's not too dissimilar to other countries which have split their capital cities in two: Turkey's Ankara/Istanbul, Canada's Ottawa/Toronto and, perhaps most notably of all, the USA's Washington DC/New York. It's unlike me to visit a country and not experience its capital but, to use the Aussie vernacular, I don't "give a stuff". No one else cares about Canberra, so why should I? Sydney has an impressive downtown area (Aussies use the term 'CBD' instead of city centre). Its glass towers make you feel like you're locked into a some sort of corporate nightmare but the city's independent cafés and bistros go a long way to curbing this impersonal corporate excess by adding a much-needed slice of local flavour. Many serve an awesome latte with equally awesome Aussie friendliness. Note to self: Aussies tend to talk. A lot. In fact, to use current parlance, they 'over share'. It is quite normal to get a chunk of someone's life story wherever you happen to be: browsing in a clothes store, travelling in a lift, standing on a street corner waiting for the pedestrian lights to change. They also tend to interject in what you had assumed was a private conversation, joining in as if they know you. Never before have I been so reminded of my British reserve and aloofness than in Australia. Some find Aussie frankness rude, others liberating and refreshing. I'd opt for the latter. The Sydney Harbour Bridge is the largest single span arch bridge in the world and was, incongruously, designed by a company in Middlesbrough, UK. For around £150, and by booking well in advance online, you can climb over the top of the bridge's famous iron arch. It just so happened to be my birthday, too. Viewing the famous Sydney Opera House and the glittering towers of Sydney's CBD from a unique 360 degree standpoint was a pretty amazing way to spend my birthday - one spoilt marginally by the forceful whacking of my head on one of its steel girders. Unfortunately this would not be the last stupidity-induced injury I was to suffer on my journey Down Under. I have been to the top of many a world tower - from Lithuania to Canada . I was not about to make an exception for Sydney. An obligatory trip to the top of the woefully-named 'Sydney Tower Eye' completed my suite of stunning photographs of Sydney's skyscrapers and downtown area. These observation towers are often some of the worst tourist honey traps going but the views they provide are well worth it. Bring your camera and a dose of tolerance. A place in Sydney which also had me running for the exit was Darling Harbour - a waterside location stuffed full of families, chain restaurants and street vendors selling 'I love Sydney' baseball caps. It was horrendous and we got out of there pretty quick. Having already ticked off two bucket list items in the Harbour Bridge and Opera House, the next was to stroke a Koala Bear - one of Australia's most iconic indigenous, and absolutely wonderful, creatures. Koalas are more protected by government legislation now than at any time in the past and this means that the days of holding or hugging one are long gone. We travelled out to the Doonside suburb of Sydney to the Featherdale Wildlife Park getting trains, taxis and buses to get there. Being a little more off the beaten track meant that the sanctuary sidesteps the worst of the tourist hordes resulting in a more intimate experience. This was really the only option as the local Sydney city zoo, Taronga, had long stopped the tourist petting of Koalas as it was just not sustainable with the numbers of tourists visiting there. I was more than satisfied, though, with the chance to stand next to a Koala called Chloe and stroke her rough, thick fur. She was fast asleep on a branch stuffed full of eucalyptus leaves and took absolutely no notice of me. A member of staff was on hand to ensure that each person patting Chloe's furry behind was doing so in exactly the correct way and that all camera flashes were switched off. Apparently when the bears are fed up of being petted in this way, they simply climb down the trunk and walk away. Some stay for ten minutes and others, like Chloe, stay for a couple of hours (the government imposes a strict limit of three hours for this kind of thing). The park also allowed me to see other weird and wonderful creatures unique to Australia: Wombats, Quokkas and Echidnas. I also ended up feeding a few Wallabies (small kangaroos) who had taken a liking to the cone of food I was holding. I wasn't to know it at the time but we were to see plenty of Kangaroos out in the wild on our driving tour of the south east coast of the country. The awesome sail-like shapes of the iconic Sydney Opera House. Climbing to the top of the Sydney Harbour Bridge Climb affords wonderful views of the famous harbour. Sydney's CBD is as close as you'll get to a Manhattan in the Southern Hemisphere. Sixty miles west of Sydney, and easily accessible by train from Sydney Central, lies the Blue Mountains region which has some of the grandest and greatest views of bushland going. Vast valleys are covered with eucalyptus gum trees which emit an oily mist giving the mountains a blue hue and thus this region's name. A trip out to the Blue Mountains is a chance to experience one of Australia's most popular bushwalking destinations in easy reach of a major city. The must-see vista of the Blue Mountains is Echo Point at Katoomba with its Three Sisters rock formation. It being a must-see means you're likely to share your wow moment with coach loads of infuriatingly excitable tourists screaming and laughing at the top of their voices at the view of Jamison Valley. Quite why looking at an incredible landscape is so hilarious I have no idea. Because they always seem to travel on coach tours, rather than independently, they often come in groups of fifty plus which then unforgivingly descend en-mass. If you head to Echo Point yourself, take earplugs and a reserve supply of patience. Two stops further along the train line from Katoomba, and a place which sidesteps the worst of the aforementioned tourist hordes, is the town of Blackheath. It's the kind of place which has quirky little cafes, retro reclamation shops with golliwogs for sale in the window (yes, you read that right) and where locals pass you by but not before they've greeted you with the obligatory "G'day". Being a little off the tourism track Blackheath retains a local and authentic charm and is the best place to base yourself if you're considering an overnight stay in the Blue Mountains. We stayed the night at the wonderful Glenella Guesthouse, a characteristically Australian building built in Victorian times complete with wooden verandah and corrugated metal roofing. Being high above sea level, and with August being the Australian winter, temperatures dropped to near zero. Luckily, the guesthouse came complete with a log fire and an electric blanket. The guesthouse was also perfectly positioned for a spot of Bushwalking along the valley's edge. We opted for the Cliff Top Track - some five kilometres along a dusty path which cut through dense eucalyptus trees with steep ascents and descents, and with awesome lookout points along the way to take in the immensity and uninterrupted beauty of the view. Despite keeping a keen eye out for them, we didn't see any koalas so we satisfied ourselves with the odd sighting of a techni-coloured bird and some unusual-looking vegetation. The giant gorge of eucalyptus trees at Blackheath seen from one of the lookout points along the five kilometre Cliff Top Track. 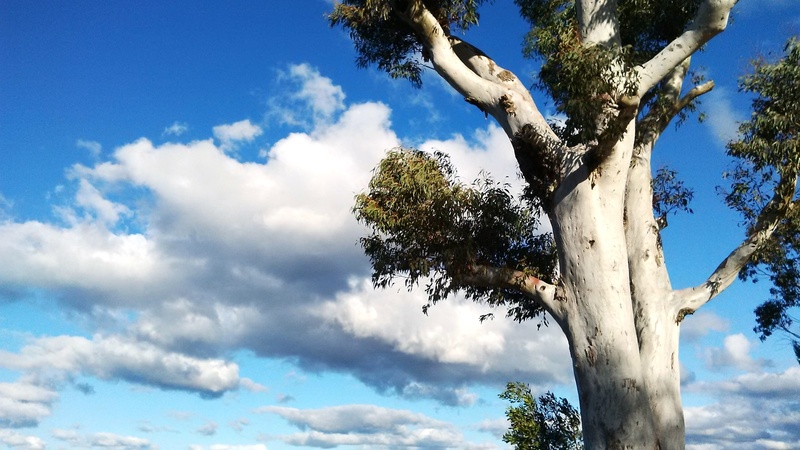 The bulky white trunk of a eucalyptus trees against blue sky at Blackheath. Narooma is around five hundred kilometres from Sydney: enter stage left our hire car. The journey to Narooma, renowned for its whale watching opportunities, took us along the very scenic Princes Highway and a small chunk of the Great Pacific Road. If the scenery, sudden rises, falls and zig-zags of the road don't keep you interested the bizarre place names like 'Bombo', 'Jamberoo', 'Ullawulla' and 'Gerringong' will. Honestly, I am convinced there is not a bland place name in the whole country. For added local flavour on your driving trip try listening to the National Indigenous Radio station or you could look out for the iconic yellow diamond signs along the route warning drivers of kangaroos, possums or wombats crossing. I managed to catch a few of them - but not the one saying "Warning Possums Crossing!" Unfortunately any road journey in Australia will inevitably be interspersed with sightings of squashed wombats and large kangaroos slumped dead over motorway barriers. The amount of roadkill in Australia is extraordinary. With an expanse of majestic and magical scenery and mutilated animals, our car driving adventure oscillated between the heavenly and the bloody horrific. Driving meant that we also got to see the curiously incongruous architecture of the south coast's small towns - a number of which we stopped off at for a coffee and snack. These were places which would look more at home in the American Wild West: wooden panelled shop fronts with corrugated metal roofs and wooden verandahs. All that was needed to complete the picture were dusty roads and horses and possibly a couple of cowboys gun slinging. Narooma township had some wonderful examples of this style of architecture which owes its roots to the gold rush of the late nineteenth century. We set off early the next morning to 'do' Narooma before crossing the New South Wales border and onto the capital of Victoria state: Melbourne. Having driven for eight hours along the Princes Highway from Sydney, we arrived in a freezing cold Narooma and checked into our motel (my first ever). Arriving so late meant that Narooma was pretty much a rest stop along a bigger journey to Melbourne. We'd left it too late to organise a whale watching trip so satisfied ourselves with a walk along the coastline in the hope of seeing another famous Narooma inhabitant: seals. Grey seals sunning themselves on grey rocks are very hard to spot. Luckily for us, a whole hareem of seals had taken to basking in the sunshine right opposite Australia Rock, a rock formation whose hole coincidentally creates the outline of Australia. Unfortunately for me, this was where I had accident number two. Wearing completely the wrong gear for scrabbling over wet rocks to get a better shot of Australia Rock I slipped and landed on my back in a rock pool - soaking everything I was wearing and very nearly claiming my non-water resistant camera and phone. Luckily they survived with no water ingress - but only just. My stint as a really poor excuse for a mermaid soon revealed another symptom after the adrenaline had subsided: very sore ribs which made it painful to move and breathe deeply. Whoops! I thanked myself that it was not any worse. Not for the first time on the trip, the first aid kit came into its own. Narooma, and me, were done. 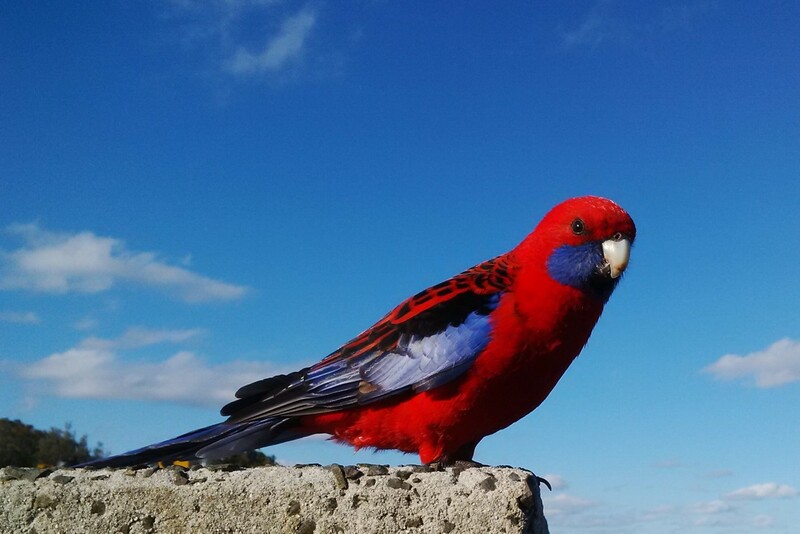 En-route to Narooma: a stop-off at Bald Hill to pick up a coffee from a burger van brings me face to face with a Crimson Rosella parrot. These were a common sight on my trip in south east Australia. Australia Rock at Narooma beach whose formation mimics the outline of Australia. A seal enjoys the sunshine along the Narooma coast. Melbourne is the capital of Victoria state - our second, and last, big city. All signs told us that Melbourne would not be a reprise of Sydney; Melbourne was different. There is a distinct sense of rivalry between the two cities - Sydneysiders stating, perhaps a little disparagingly, that Melbourne was "very different" - the word very often followed by a raise of the eyebrow or a serious, disapproving, tone. One friend summed it up succinctly, passing on a well-oiled Melbourne phrase: "If Australia were a body, Sydney would be its heart but Melbourne would be its soul." Sydney has the internationally recognised icons but Melbourne has... well, what exactly? Everyone has heard of Melbourne - but just how many can say what's actually there? Whereas Sydney is corporate, mainstream and touristy, Melbourne is alternative, creative and edgy - although your initial impression of the city may mistakenly be formed on its CBD and glitzy shopping arcades. A walk along the Yarra River with its token skyscrapers, glass fronted restaurants and joggers in lycra is all pretty soulless stuff and characteristic of most modern cities these days. However, Melbourne is one of those places which insists you work that little bit harder to get to the real heart. The city's Laneways are a good place to start - grungy alleyways and backstreets where small, independent bistros, coffee shops and eateries are crammed - so much so they appear to ooze out from their cramped units and onto the tiled lanes themselves and all the while any scrap of free wall space has been claimed by urban graffiti artists (of varying abilities). Indeed, there are some alleyways which have become one huge graffiti canvas where artists have been allowed to run riot with their ideas and their spray cans. We tracked down the most famous: Hosier Street. I have seen graffiti before, but never in such density. Walls, doors and windows are covered from top to bottom. Even the bins have reluctantly become part of the artwork. 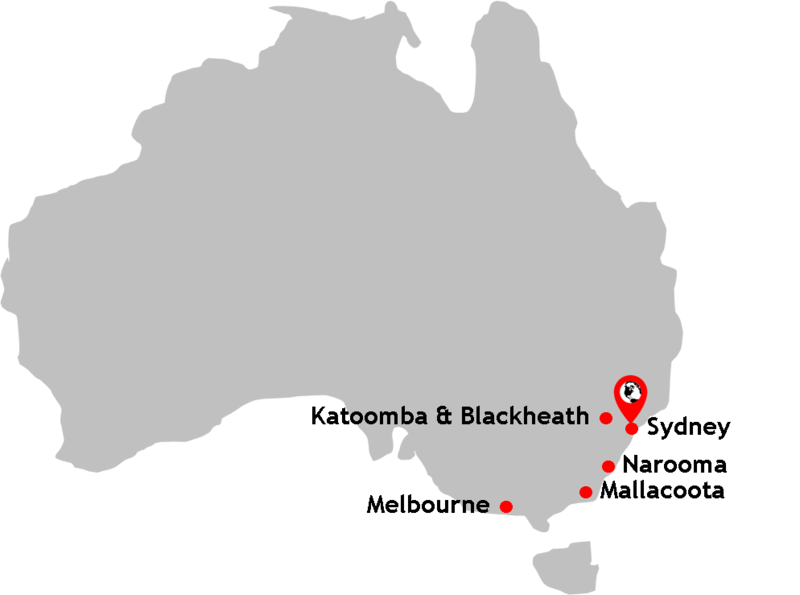 Whereas Sydney is about the CBD, Melbourne is about its suburbs - small, trendy areas with independent bars and restaurants like the area of Collingwood. These kinds of places are where 'real Melbournians' go for a night out and are probably the best place to head to if you want to go beyond superficial city sightseeing. We went to a small restaurant on Gertrude Street run by an Aussie rendering of Jack and Vera from Corrie. Vera's favourite word was "darl" (darling) and we exchanged stories with Jack about Australian soap operas. The food was naff, but the fun and a glimpse into real Melbourne life more than made up for it. Melbourne's modern architecture, like wavy apartment buildings, multi-coloured abstract fascias (most notably that of the RMIT building) and cubist carbuncles (like that of the truly gross Federation Square), tries to emulate, or at least reflect, the city's alternative and anti-mainstream disposition. Some of these buildings would not be out of place in an optical illusion picture whilst others border on the surreal. Melbourne is a far more interesting place to photograph than Sydney. Such creativity is juxtaposed with Victorian era buildings which help anchor the city's architectural extravagance and give it, at least, some sense of history. The soap opera Neighbours has been made in a Melbourne suburb since its beginning. We were considering going on the official Neighbours tour but, realising I actually haven't watched it in years and won't know what it was I would be photographing, we decided to give it a miss. However, from this I discovered that a soap I had watched religiously as a teenager, Prisoner Cell Block H, was also made in the city. Further digging around online revealed that the iconic red brick wall, which featured in every episode as the exterior of the jail, was still there - and had, after more than three decades, retained many of its fake windows and bars. So, a trip out to Nunawading some 30km outside of Melbourne by train and then taxi, brought me face to face with the wall I had seen so many times on my TV - but not before walking through a private housing estate, squeezing through bushes and pressing my camera against the perimeter fence of the former Channel 10 studios. A chat with the security guard at the entrance to the now named Nunawading studios, and by putting on my best personable performance, yielded no closer access. In typical Aussie bluntness he said he didn't give "a rat's arse" about me going in there to take photos of a building, but said his hands were tied and he wasn't allowed to let us in. Never mind. I was more than satisfied with what I'd seen. A very niche day trip out, certainly, but a brilliant one too. 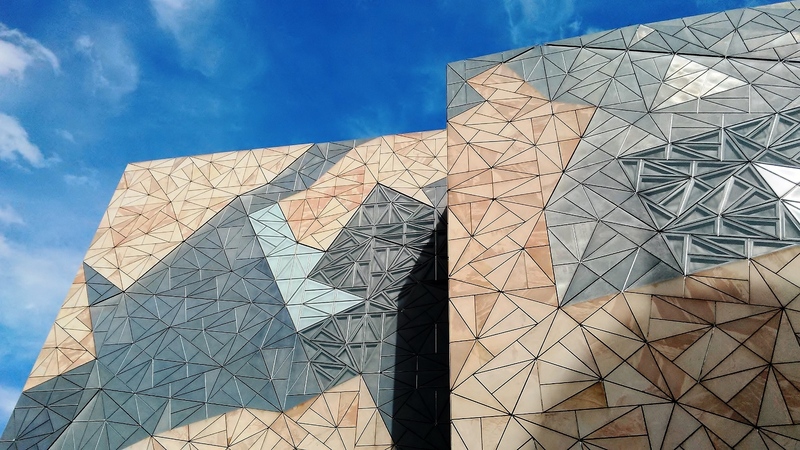 A rather flattering shot of Melbourne's rather carbuncular Federation Square. Nice to photograph but probably not nice to have to see every day. A rather wonderful mosaic sculpture along the banks of the River Yarra. A winter's scene along the River Yarra. 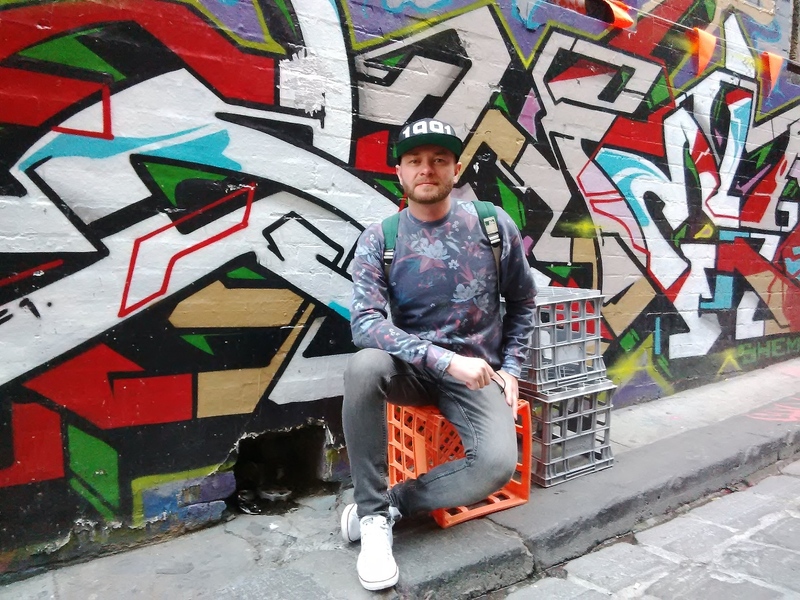 The graffiti canvas that is Melbourne's Hosier Street. 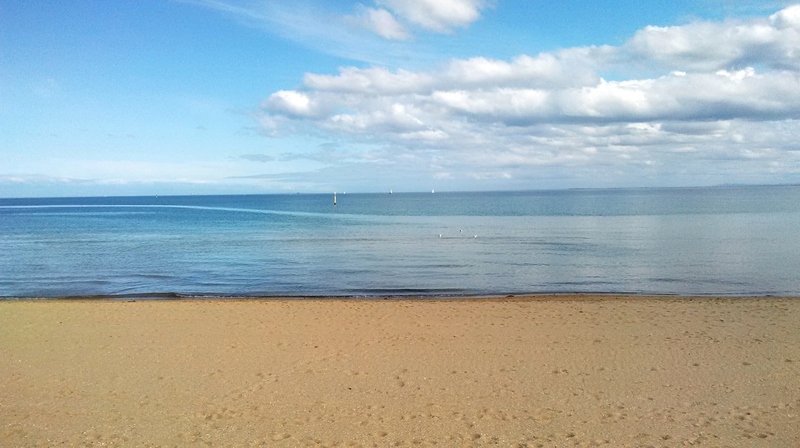 St Kilda beach layers: sand, sea and sky. Our only evening in Mallacoota was spent catching a few shots of the lakeside view, passing a mob of what seemed to be giant kangaroos, and then heading into the main 'town' (population: 900) for a meal at the local hotel - which was as old-fashioned as they come: outdated and yellowing sports photographs of the local team hung on the wall, dusty animal heads from past hunting successes joined them and...the food was lovely! A log fire greeted us on return to the lodge, as did, thankfully the owner who gave us the keys to his house and buggered off. A small heater and electric blankets kept the worst of the cold out of our little cabin taking us swiftly to morning - and the most Aussie dawn chorus imaginable. Malacoota Inlet seen from our guesthouse porch. The birdsong in the morning was magical. There's a lot to be said for flying between Melbourne and Sydney - but make sure you find time to sample life outside of the big cities for a slice of Australia less impacted by tourism. There's a nasty practise of hotels charging you 2% for using your credit card to pay for your stay. Check before booking or get stung with a hefty hidden extra. Contrary to what you may expect, public transport in NSW and Victoria is very cheap. Each state uses its own Oyster-like card system which links most forms of transport. NSW has the Opal card, Victoria has the Myki card.